HealthPartners Neuroscience Center in St. Paul is one of the Top Projects of 2017, presented by Finance & Commerce. The facility, built by Kraus-Anderson, is one of 33 projects named by a panel of independent judges for achievements in creativity in design, innovative construction techniques, cooperation among contractors and management, and sustainability efforts. The four story, 174,000 s.f. 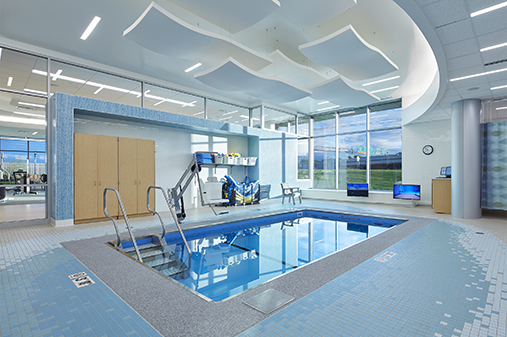 facility, designed by BWBR Architects, is the largest free-standing neuroscience facility in the Upper Midwest, and one of the first in the nation. The facility’s sweeping, dramatic glass curtainwall exterior makes an immediate impression. The center brings together HealthPartners’ nationally-recognized programs for stroke, spinal care, dementia, Parkinson’s disease, Alzheimer’s, brain and spine tumors, and other neurological disorders along with clinical research and trials, all under one roof in a patient-focused design. Features include a gym-like rehab center, meditation room, family-friendly waiting areas and a dramatic staircase with suspended sculpture. Also included are administration offices and a 298,000 s.f. parking ramp with 600 stalls. The building is designed to accommodate two future floors and one additional parking level. 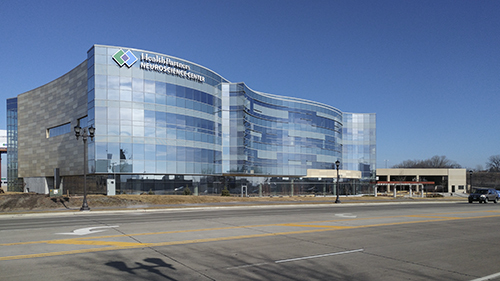 The center is located on Phalen Boulevard new I-35E, in the medical corridor that runs between Regions Hospital and HealthPartners Specialty Clinics in Saint Paul. View the Top Projects Award story.